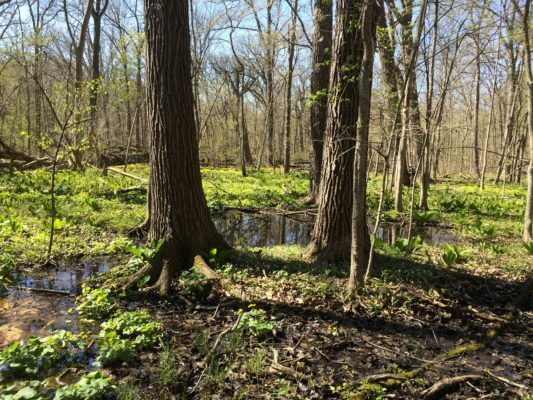 In May 2018 a large and diverse forest complex near Joliet, known as Pilcher Park, was dedicated as a Nature Preserve by the Illinois Nature Preserves Commission. The dedication culminates a nearly four-year effort by the Illinois Audubon Society, Joliet Park District, Illinois Clean Energy Community Foundation, and Illinois Nature Preserves Commission to expand and protect one of northeastern Illinois’ premier woodlands. The dedication protects in perpetuity, 293 acres as Nature Preserve and an additional 110 acres as a Land and Water Reserve at the site. The park is owned and managed by the Joliet Park District and features outstanding spring wildflower displays and old-growth trees. In September 2014, the Illinois Audubon Society applied for a grant from the Illinois Clean Energy Community Foundation to purchase 80 acres of privately owned property adjacent to the park’s north boundary, with the intention of transferring the property to the Joliet Park District in the future. Achieving permanent protection for the high quality resources at the site was a condition of the Illinois Clean Energy Community Foundation funding. The property transfer between the Society and the Park District was completed in August 2017 and expanded the park to 403 total acres in size. Dennis O’Brien, Executive Director of Illinois Clean Energy Community Foundation, notes that several factors contributed to the success of this project including the expertise provided by the Illinois Audubon Society’s former director, Tom Clay, and local Will County Audubon Society Volunteers, a commitment by the Joliet Park District to permanently protect habitat and guidance from the knowledgeable staff of the Illinois Nature Preserves Commission. “The Foundation is pleased to have helped make the permanent protection of Pilcher Park a reality,” said O’Brien. Pilcher Park is a well-established urban natural area, with miles of hiking trails and roads, outdoor recreation and a nature center with many park district-sponsored activities and education programs. Allowable uses on designated trails throughout both the Nature Preserve and Land and Water Reserve include hiking, nature observation, bicycling, cross-country skiing and walking leashed dogs.